Designed for life’s varying sizes the Serenity™ high back executive chair provides a luxurious seating experience. This black leather executive office chair is especially designed for the big and tall user with a weight capacity of 500 lbs. You'll be working in total style and comfort when you're seated in Safco's Serenity Leather High Back Big and Tall Chair. This roomy, heavy-duty office chair has a five star over-sized base, a five hundred pound weight capacity, and a swivel seat. 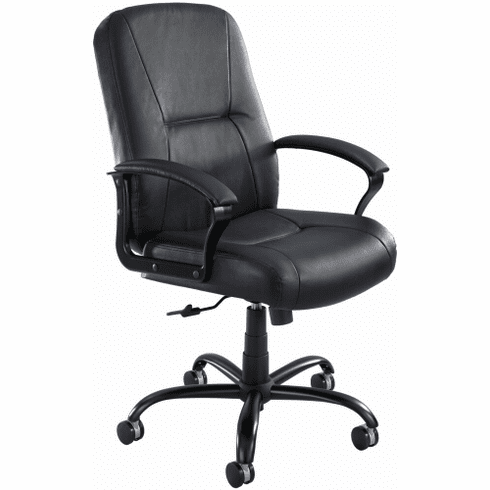 A tilt lock feature and pneumatic height adjustment add to the comfort and usability of this black leather office chair. Overall Height: 45 ½ to 48 ½"